Cleveron developed two world’s biggest click and collect pickup robots for Zara’s pioneering flagship store in Westfield Stratford, which was opened on May 17. Both CleverFlex parcel delivery robots have 1,200 parcel trays and together can handle 2,400 orders simultaneously. Zara’s new concept store, which totals 4,500 square meters, enhances the in-store shopping experience by integrating offline and online, including automated order collection points, self-checkout and mobile payment systems. 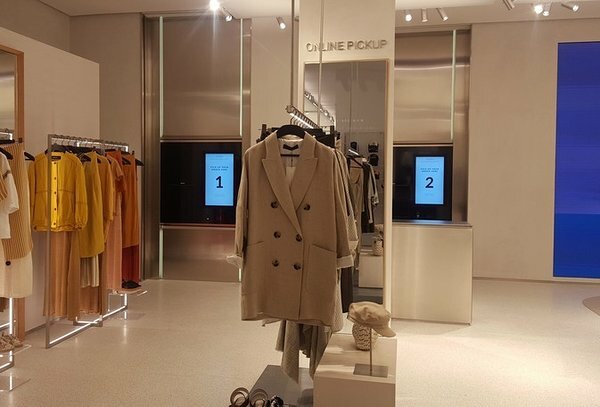 Shoppers can collect purchases made through Zara’s ecommerce platforms from Cleveron’s automated click and collect pickup solution CleverFlex. The two CleverFlex machines are seamlessly integrated inside the service area walls and can handle 2,400 orders simultaneously. When the customer places an order on Zara’s online platform, they receive a unique QR and PIN codes. On collecting the order in the store, the customer scans the QR code or enters the PIN to CleverFlex’s screen. The robotic hand, which collects trays and organises the packages optimally according to their size, delivers the order for the customer in seconds. CleverFlex uses the similar technology as our towering PackRobot. The U.S. retailer Walmart has already set up hundreds of PackRobots in the USA under the name of Pickup Tower, offering fast and convenient in-store pickup for online orders.